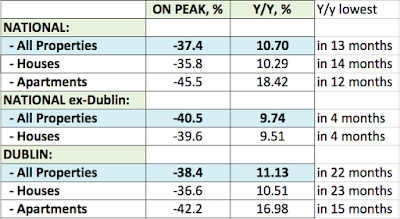 Latest data from CSO for June 2015 shows significant slowdown in house prices inflation across all segments of the market. 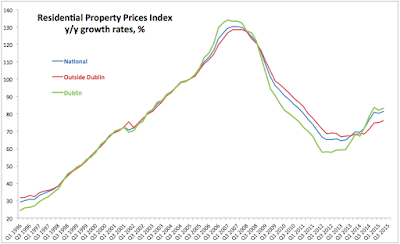 Dublin residential properties index in 2Q 2015 was 15.4% up on same period in 2014, which marks a major slowdown in growth from 21.9% y/y growth recorded in 1Q 2015. 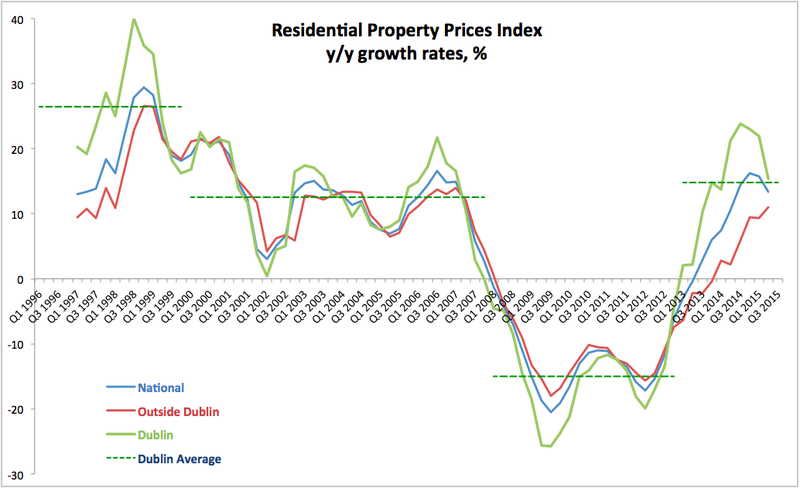 Outside Dublin residential property prices rose 10.98% y/y in 2Q 2015, which is faster than 9.39% rise in 1Q 2015. National residential prices were up 13.40% in 2Q 2015 compared to the same period in 2014, while 1Q increases were slower at 15.75%. So what is going on in the markets to drive prices inflation moderation? Poor affordability: wages growth did not keep up with prices inflation in recent years, which means that once the savings pool for downpayment cushions is exhausted, households will be finding it increasingly difficult to secure purchases at current prices. Affordability is also impaired by rising rents - which take larger and larger chunks of household income that could have gone to savings for a downpayment on mortgages. 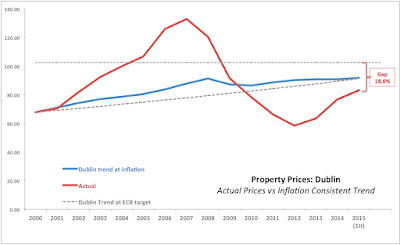 Households' purchasing power in the property market was also reduced significantly by new lending caps introduced by the Central Bank of Ireland back in February this year. Caps restrict mortgages to LTV ratios <80 15="" 85="" all="" be="" can="" for="" in="" issued.="" issued="" loans="" mortgages="" new="" of="" only="" other="" words="">80% LTVs. Additional caps apply to loan-to-income (LTI) ratios, with only 20% of new loans allowed to exceed 3.5x income. Irish house prices are currently at around 5x average / median income nationwide and 6x in Dublin Worth noting that CSO series for house price indices are based on 3mo average, so February changes can be expected to feed through into data from around April on. 1Q effect was largely anticipatory, while 2Q effect is now pricing CBI rules changes. 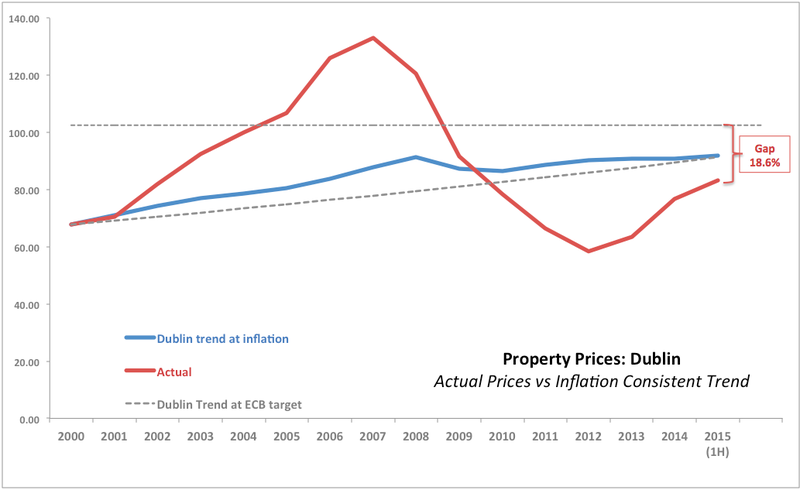 Geographically - the above effects are compounded in Dublin where income ratios are more stretched and rents are higher and rising faster. 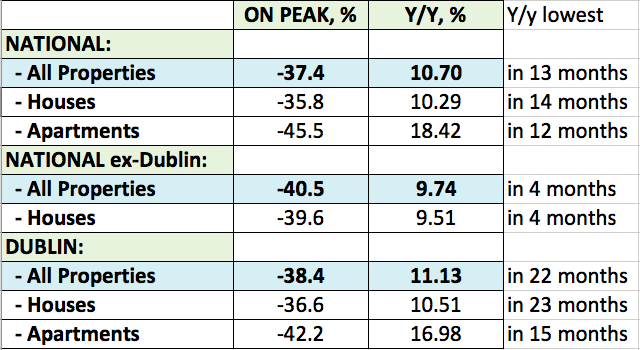 In line with the above, transactions volumes are slipping as well: in 1Q 2015 volume of transactions registered in Ireland was up 54% y/y - signalling buyers booking in pre-restriction mortgages. In 2Q 2015 this appears to have fallen (data is still incomplete) to a 17-19% growth rate y/y. Compared to FY 2014 average increase of 45% this rate of transactions growth is low, although in my view, the supply of quality properties in the market has also moderated significantly in recent quarters. Are we going through another boom-to-bust sub-cycle here? I am not sure. All will depend on what prices will do over the next 12 months or so, with potential trend change (from downside to growth) around 1Q 2016. Too far to call.